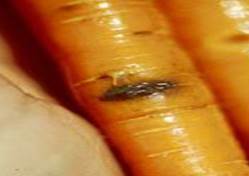 Cavity spot is a common disease of carrots grown in California. The disease results in a small fungal spot on the carrot, which can be easily trimmed away by consumers. However, this “cosmetic” defect is not acceptable to consumers. If growers do not control cavity spot in their fields by using fungicides, their carrots would have to be sorted manually to remove the damaged ones. The sorting costs are prohibitively high; fields with high levels of cavity spot are simply not harvested…… because of consumer standards. “Out of the 62,000 acres of carrots grown in California, cavity spot is one of the top three problems that farmers need to worry about. Unlike other vegetable diseases and pests, cavity spot doesn’t cause direct yield losses. It does, however, cause cosmetic damage, which in the world of carrots, is equivalent to yield loss. Cavity spot is a chronic problem and even growers with the best managed fields know that,” says Jim Farrar, a professor of plant pathology in the Department of Plant Science at California State University, Fresno. Farrar, who has studied cavity spot for the past several years, along with UC Davis researchers Joe Nunez and Mike Davis, says that most growers can accept some level of cavity spot damage in their fields. But fields with even 5 percent cavity spot damage can cause a real problem. Title: New Materials and Techniques for Treating Carrot Cavity Spot. Source: Carrot Country. 2012. Fall:13-14.